Émile Decoeur (1876-1953) was apprenticed to Edmond Lachenal from the age of 14 (1890) at Chatillon-sous-Bagneaux (Seine) learning the essential pottery-making skills, initially in working and glazing earthenware. He began to exhibit independently from about 1901 and developed an interest in stoneware a year or two later, experimenting with more demanding glazes such as high temperature flammées. He opened his own studio-workshop at Fontenay-aux-Roses (Seine) in 1907, moving into porcelain - as did several of his contemporaries. Towards the end of his life he worked at Sèvres from 1939-42 and remained as consultant to the factory until 1948. Over a long career, Decoeur played an important part in French artistic and studio ceramics, specialising in thick, matt glazes in creamy greys, greens, blues and pinks. 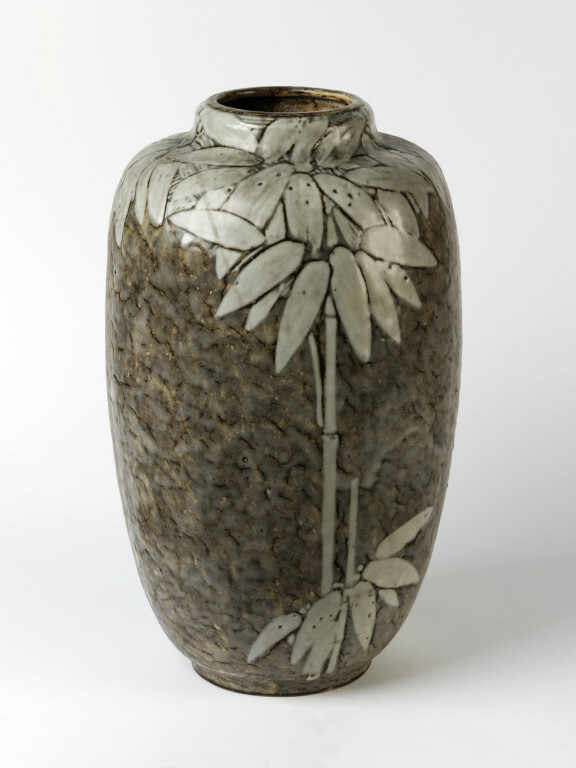 From around 1910, he introduced a variety of ornamental techniques like incising or carving, as well as painting in thick slip (liquid clay) as on this vase. Changing his decorative style to match the fashions of the times, this vase suggests 1920s Art Deco. 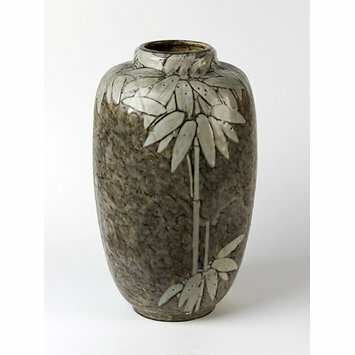 Large grey stoneware vase with a high shoulder and low neck. The body of the vase is covered with an extremely thick glaze of mottled grey, cream and brown; the neck and shoulder are decorated with a low relief pattern of overlapping bamboo leaves in creamy white, with incised outlines. At the front of the vase are two white bamboo stems, rising from a cluster of leaves near the base to meet the leaves around the shoulder. Formerly part of the Handley-Read Collection. Charles and Lavinia Handley-Read were highly knowledgeable collectors. The V&A acquired a number of objects in all materials on their deaths in 1972.